Indeed, this autumn dish incorporates many of the ingredients we associate with fall: apples, acorn squash, cranberries, pumpkin seeds (in the form of pepitas, those green pumpkin seeds without the tough outer shell). It’s super delicious, leaves me feeling full, and provides that wonderful clean-energy sensation achieved by eating a meal made from real ingredients rather than the processed yuckies (boo to processed yuckies!). -About the kale: while I’m obsessed with it, I realize some people are not a fan of the thick texture or flavor of it raw. If that is you, please feel free to use another green, such as spinach, which would be absolutely lovely in this recipe. 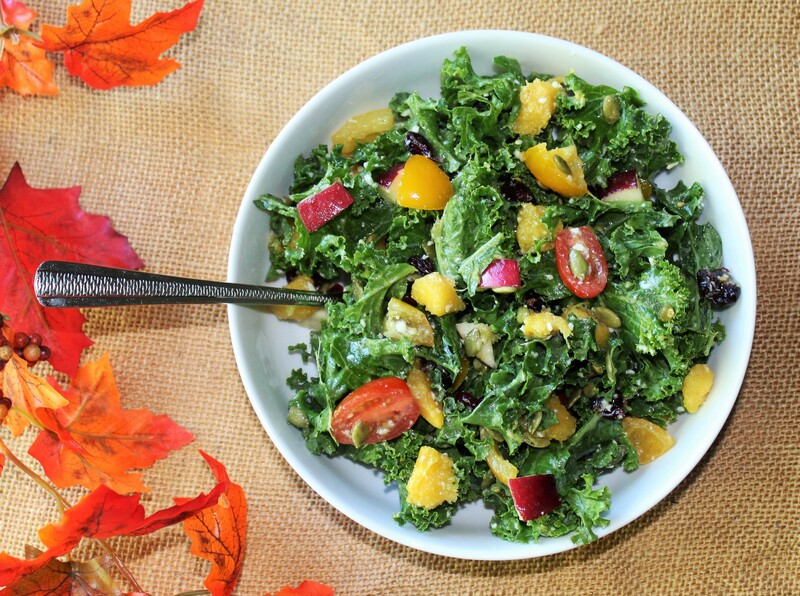 Or if you’d like to use the kale but want to break it down a bit first, try this massaging technique that makes it more malleable: before adding the other salad ingredients to the mixing bowl, throw in the kale with a little bit of olive oil and massage it between your hands for several minutes. This will help break down the leaves and make them softer and easier to digest. -And . . . the dressing: I found that the amount of dressing my recipe produces felt like the perfect amount for this salad. It coated everything evenly, but it wasn’t overpowering. However, those of you who prefer a more generous coating of dressing – as I often do – may want to double the recipe so you can use as much as you’d like. I initially did have the measurements of the dressing doubled for Draft 1 of this recipe, but I had quite a bit left over after using it on the salad, and it didn’t store particularly well for me. It could simply be that my fridge is overly cold, but the dressing solidified, and then when I nuked it in the microwave to transform it back to liquid form, the cheese was a hot mess. It was edible, but not ideal. Another recipe bonus: you can reserve acorn squash seeds and roast them as you would pumpkin seeds! I was very excited when I confirmed this. It makes sense, but you never hear people talk about roasting squash seeds, so it’s a novel idea for me. Here’s how you can: separate the seeds from the guts and rinse them clean. Spread them out on a dishtowel and let them dry overnight. Then preheat your oven to 400 degrees. Toss in a bowl with a few teaspoons of a high-smoke-point cooking oil (such as grapeseed or avocado oil), some salt, and any other desired spices (I like garlic powder and a dash or two of cayenne pepper). Disperse onto a cookie sheet and let bake until golden and crunchy – about 30 minutes – stirring every 10 minutes to aid in even cooking. Preheat the oven to 400 degrees. Cut the acorn squash in half lengthwise. Scoop out the seeds and guts. Place into a baking dish with the cut sides facing up. To the hollow of each half, add the pieces of cubed butter. Drizzle evenly with the maple syrup, and sprinkle with the kosher salt. Finish by sprinkling each half with black pepper via a few turns of your pepper grinder and poking several holes into them with a fork (so the steam can vent). Bake in the oven for about 45 minutes, or until the flesh is tender when pierced with a fork. Let cool, then cut the flesh away from the outer shell and chop it the best you can into cubes, measuring out one cup’s worth. The squash will be soft, so they likely won’t be perfect, but that is just part of their charm! 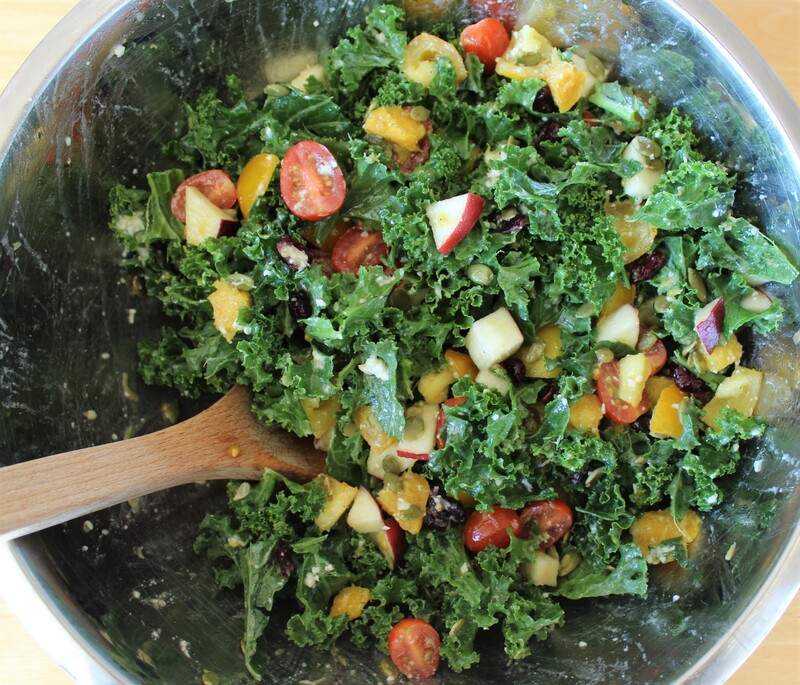 In a large mixing bowl, toss the kale with the cubed squash, tomatoes, apple, pepitas, and cranberries. Next, make the dressing. To a Mason jar or other container with a lid, add the dressing ingredients and shake vigorously for a good 30 seconds. Pour the dressing over the salad and toss so that it coats it evenly. And you are done! Makes about four hearty servings.